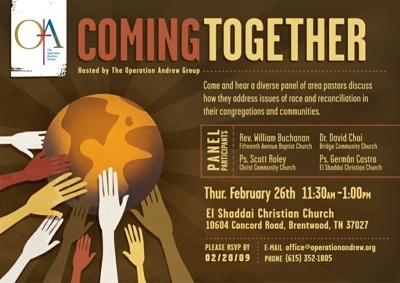 Operation Andrew is sponsoring a lunch panel Thursday called Coming Together, to discuss race and reconciliation in the context of area pastors' congregations and communities. The event will be held at the El Shaddai Christian Church at 10604 Concord Road, from 11:30am - 1pm. During the first four days of June 2000, the Middle Tennessee Billy Graham Crusade was held in Nashville. The Executive Committee of the Crusade was deeply moved by all that it saw God do as racial, ethnic, cultural, and denominational walls were broken down for the purposes of evangelism. As the Crusade ended the Executive Committee agreed that some ongoing strategy needed to be developed so that the good things that the Crusade produced might continue and expand. A special committee was appointed and before the end of the year The Operation Andrew Group was formed as a non-profit 501(c)3 ministry organization. Mayor Purcell boasted of Nashville being a "friendly" and "welcoming" city. Vice Mayor Gentry said, "Nashville looks like it's never looked before," in an apparent nod to the diversity of the crowd, which was well represented by various ethnic groups, including African-Americans, Asians, caucasians, and indigenous/mestizo Hispanics. "It is great to see you here in peace, love, and unity," continued Gentry to applause. "I want to thank Luis Palau for bringing hope to Nashville," he said. Nashville has also addressed race, reconciliation, and religion in the locally written and produced film The Second Chance, a 2006 movie starring Michael W. Smith and jeff obafemi carr, with a supporting role performed by Yuri Cunza, current president of the Nashville Area Hispanic Chamber of Commerce (Hispanic Nashville Notebook story here).